SENTRY HILL–At first, the focus was on the chairlifts, similar to those used on skiing slopes, steadily climbing from the foot of the valley floor to the top of Sentry Hill, the highest point on the Dutch side. This was followed by the mechanism of operations and the unfolding view of Rockland Estate Park and surrounding neighbourhoods. But, the pièce de résistance and the stunned moment for almost all riders on the chairlifts on Wednesday afternoon was when they got on the second stage of the lift to crest the hilltop only to be greeted less than half way there by a high-flying bird’s eye view of Princess Juliana International Airport SXM, Simpson Bay Causeway and all the way to Anguilla! This treat was especially for attendees and press of the St. Maarten/St. Martin Annual Regional Tradeshow (SMART). Rockland revved up its chairlift to offer a sneak peek into the country’s newest attraction set to open around the end of summer. 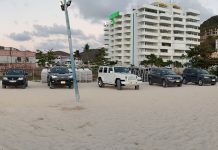 Tourism and Economic Affairs Minister Mellissa Arrindell-Doncher, who experienced the adventure activity for the first time, told The Daily Herald as she stood on the viewing deck of Sentry Hill that this newest addition to the country’s portfolio will “definitely boost tourism” to the destination. “It was amazing,” she said of the experience, adding that the product is well poised to market itself as a featured attraction. The view on the way up and at the top could not have been imagined, she said, as almost every few metres reveal something different. The views at certain points highlight Anguilla, St. Barths, Saba and St. Eustatius and Tintamarre, as well as a venue closer to home – Dr. A.C. Wathey Cruise and Cargo Facilities. Rockland offers several ways to experience the historical estate such as the Soualiga Sky Explorer, a chairlift with a series of 58 four-passenger chairs. Riders will be as high up as 72 feet, going 250 feet per minute. Top of Sentry Hill, riders will be some 1,125 feet above sea level and enjoy a 360 degree view from walkways and platforms of the islands. 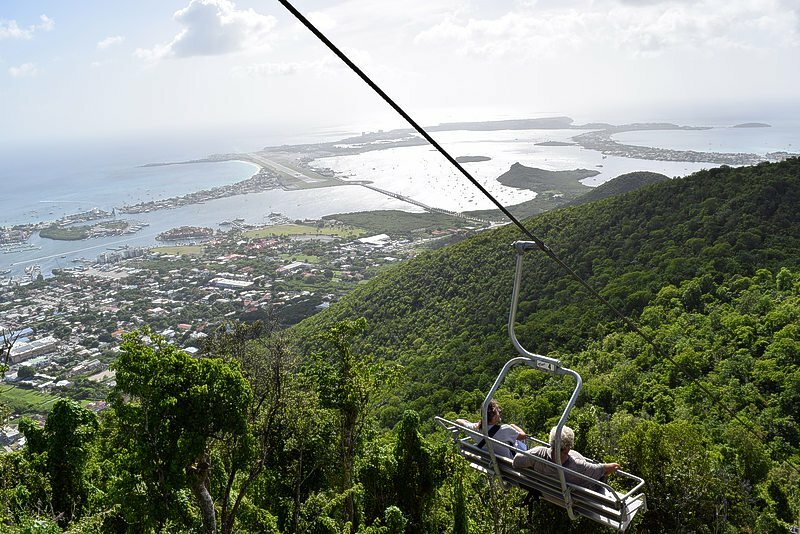 St. Maarten is now home to the steepest zip line in the world, the Flying Dutchman. “Flyers” can have the thrill of a lifetime, harnessed in a chair and launched down the Sentry Hill on a flight line at 56 miles per hour dropping 980 feet in elevation over 2,630 feet. For the not-so-fearless there is the Sentry Hill traditional zip line. Children can experience jetting down the hillside on the Schooner Ride (under construction). Pricing for the adventure is still being fine-tuned, but Rockland Officials said the price for residents will mirror the US dollar amount, but in guilders (e.g. visit admission of US $59 will be NAf. 59 for locals). Locals will have access to the Rockland Estate Park on non-cruise ship days. Next articleBREAKING NEWS: Man assassinated in Santa Rosa Curacao — Police busy conducting investigation.